So the Sons Of Anarchy prequel is confirmed and creator Kurt Sutter is here to supply all the information. Ever since SAMCRO rode off into the sunset back in 2014, fans of the series have been left to their own devices to fill the leather-clad void. The announcement of a spin-off series was made in January and fans could finally celebrate the return of motorcycle mayhem, this time with the Mayan M.C. charter. As he’s said in the past, Sutter pictures the Sons of Anarchy story being played out in four chapters. One of which revolves, or will, around Jax Teller’s father, Deadline reports. 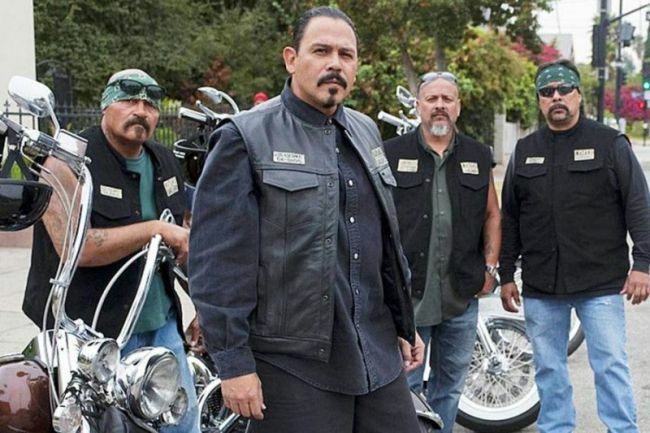 He says depending on the success of Mayans M.C., we could be seeing the tale of Jax’s family well into the future with the introduction of a prequel. In the meantime, you can finally catch the new gang on September 4 on FX. The trailer, released earlier this year, sees the crew of the infamous Mayans M.C., a rival biker gang to SAMCRO in the original series, blazing down a desert highway, set to a Spanish cover of the Rolling Stones’ Paint It Black. The big challenge of dovetailing Sons into this is, you can’t ignore what we did for seven seasons, and the fanbase of that show, because we want to bring them along for the ride. Tonally, it’s about finding the balance where it feels familiar enough to be satisfying yet can ultimately find its own voice. The challenge for both of us is, how do we honour what our creative sensibilities are in this world and then ultimately allow it to become its own thing? For him, he’s brought a lot to the table, in terms of story, and all his stuff. He runs the writers room for me, so he and the writers are doing the heavy lifting. His story sensibility has been integral in rooting this into a culture. When we were in Austin he had a really lovely point of view on it, in that we’re honouring the voice of those who are unheard, Los Olividados, the forgotten ones, that to him is really poignant. If I’m still alive when Mayans is over, I do have a thought and it’ll maybe be one of the things we lay track to. Jax didn’t destroy all those copies of John Teller’s manuscript, and at some point maybe down the line we have Drea’s character still out there with the boys, we have Jimmy Smit’s character still out there. At some point perhaps there’ll be a brother story with Abel and Thomas, coming back to Charming. Where it all began. If I’m still alive, that might be the last chapter. The prequel and sequel projects will focus on – SPOILER ALERT – Jax’s family after his death. You can catch Mayans M.C. September 4 on FX.